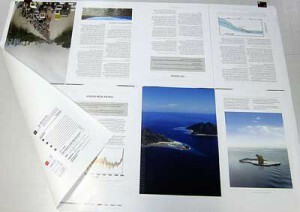 Press proofs are run on the machine that will produce the final output, and often on the exact stock that will be used. For offset print jobs, this is like a test print and very expensive, plates need to be run and the machine needs to be set up. Spending hundreds of dollars may make sense for a very prestigious project or a colour job on an unusual stock, where the influence of the stock on the final perception of the document is difficult to assess from looking at an inkjet proof. Also known as Machine proofs, test prints. Press checks are similar to press proofs in some ways: the customer comes to the press room at the scheduled start of the job and gives the ok at the beginning of the print run, sometimes taking advantage of the printer’s ability to tweak colours on a sheet. Press checks do not have to cost anything extra, as long as there are no changes to the artwork and the customer is able to come in at a the time the job is scheduled. Press checks are a good way to see your job in it’s final rendition. Press checks also show that you are interested in the out come of your job, which is not a given. At SOS, we do encourage you to come and look at your job on the press. These proofs are run on a high resolution inkjet printer. The printer is calibrate d to the press that the final job will be run on and produces similar colour (in a colour managed environment). Proofs are not cheap, often run imposed on a big sheet and they are in most cases the final sign off for colour and content. They are often called contract proofs, as the represent the contract between printer and customer: if the result from the press looks like the proof, the customer gets what they were promised and what they signed for. If the result on the press differs considerably from the proof, say because the colours come out very differently on a certain stock, the printer should put the job on hold and consult with the customer. Also known as contract proofs, digital chromalins, Approval proofs, Epson proofs, HPs. These are prints from a colour laser, they are mostly for content and they show pagination on a magazine, backup and folding in a brochure. As laser printers are notoriously temperamental when it comes to colour consistency, they are not usually used for accurate colour proofing. They are cheap, quick and often absolutely necessary as mock-ups, especially when no sample or dummy was supplied by the customer (Consider how many ways there are to fold a brochure!). For magazines and other multi-page publications these lasers are stapled, bound or placed in a ring binder to show pagination. Also known as Content proofs, Lo Res proofs. Online proofs are viewed on a screen, most of the time they are a low resolution version of the high resolution PDF that we then use to print. They can also be a rasterised PDF, taken from the processed (i.e. ripped) file from the prepress system. 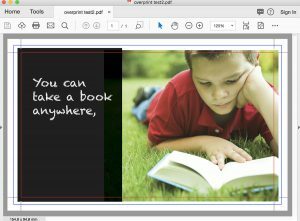 Online proofs can also be animated digital magazines that are compiled by a prepress system and that allow you to flick through a little digital mag on screen to show the way the pages fall. At SOS, we can provided either of the options above, however we default to pdf proofs for speed and convenience. Online proofs are provided on the web or via email. Online proofs are usually for content proofing, i.e. is it really the final version of the file, has that last change been made etc. Their colour accuracy depends very much on the quality of the screen they are viewed on and the colour management used in the workflow. Online proofs are also used for instant approvals in web to print systems, where artwork is created online and proofed immediately. An important note on viewing PDF proofs: Please be aware that there can be differences in the way a file shows on your screen, depending on your display preferences. The most important is probably the Overprint Preview: If this is not set to always show in Acrobat, you may miss important aspects of your artwork. A colour may change if it is set to overprint and some items, like text, that are set to overprint can disappear completely. In the example below, if you look carefully you can see a black bar that partly overprints a picture and looks different to the black area next to it. You can also see some lines of light grey text. The last line was accidentally set to overprint the black background and it therefore disappears when printed. 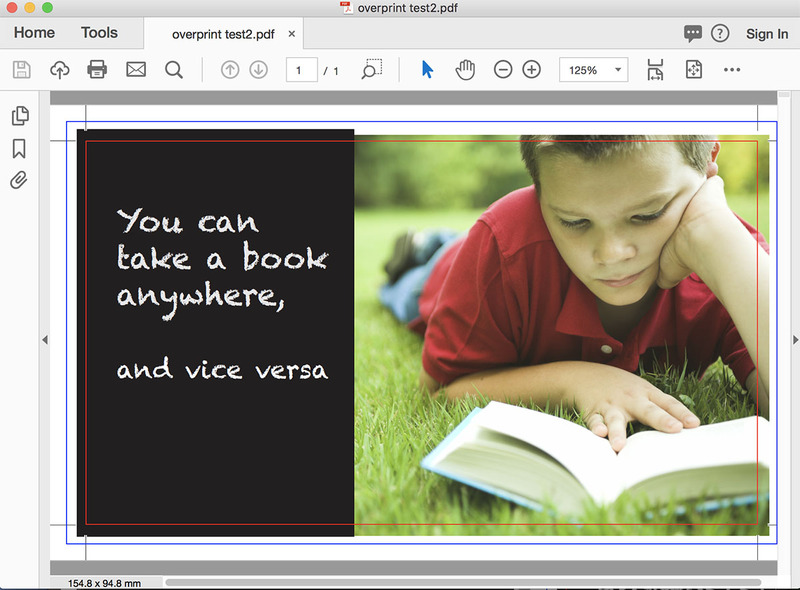 The preview on the left is showing no overprint (the Acrobat Reader installation default), the one on the right shows overprint. Please click on the images to enlarge them. Too complicated? Call us and we'll set you up.